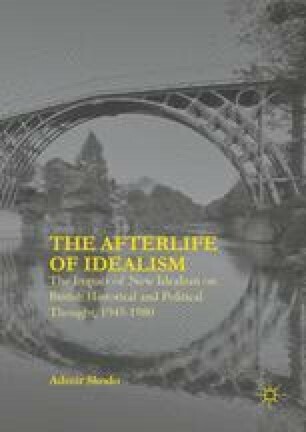 This book has laid bare how the historical and political thought of the new idealist philosophers R.G. Collingwood, Michael Oakeshott, and Benedetto Croce impacted the thought of a prominent but ideologically and conceptually diverse group of post-World War II British revisionist historians and political thinkers. These include E.H. Carr, Isaiah Berlin, G.R. Elton, Peter Laslett, and George Kitson Clark. I have pursued three arguments to conceptually map this impact: first, the new idealists’ defense of a pluralist and perspectivist methodology along with their concepts of agency, sympathy, and historical imagination was taken up by the revisionists in developing a postwar philosophy of history which responded to challenges posed by persistent teleological philosophies of history and the social sciences. Second, this philosophy of history, conjoined to elements from the Fabian tradition of historiography, informed sustained revisions of the modern English past from the Tudors to the Victorians. These revisions successfully challenged the interpretive legitimacy and institutional dissemination of liberal-whig historiography, but were in turn premised on a ‘revisionist whiggism’ suffused with welfare state political values and beliefs.